WMSoftware delivers several product, which some are especially developed for SBC environments. One of these products is Relevos which controls CPU and Memory usage on your Terminal Services. Relevos can be compared with Appsense Performance Manager and Threadmaster. WMSoftware had also setup a simple and easy installation process. Like the other installations the standard parameters need be filled in like license agreement, user information and the installation location of the program. Because licensing within Relevos is based on processors the installation asks how many processors are present in the server. Is probably would be just a license question, because we can not imagine that the program can not found out itself. Because the installation is available as MSI files, the installation can be done silent with the standard msiexec parameters. Besides WMSoftware also now offers Relevos Management System. With this software you can also can install/uninstall, configure and replicate settings from several consoles (MMC and Webbased). You need to have a ADS available to install and use the management suite, the installation itself is just pressing the next buttons again . The management suite exists of three components. One Deployment Manager and two Configuration consoles. For installation you logically need the Deployment Manager. Starting the Deployment Manager you got two options, install or uninstall the software on the systems. You need to have WMI installation provider enabled (standard not enabled on Windows 2003) and enough permissions on the target machine. Regrettably the software does not check before starting the process if the software is already installed by both options. We really like the option that reboots are standard disabled, but we miss a option to schedule the installation. Within Relevos many settings can be set divided in CPU and Memory. Of course Relevos can set a maximum CPU usage of one process (Throttling). With the advanced settings there are possibilities to specify which processes to monitor (all, only these processes or ignore these processes). Also you can specify which users are applied to this throttling rule and the default behavior of the throttling rule like responsiveness and run time above threshold. Like Appsense Relevos has is own technique to take care of overloaded processors. Relevos calls this Intelligent Priority Control (IPC). Configuration can be made for the act of the algorithm and from which CPU usage IPC should interfere. Here also working details can be set for users and processes. Within the part Usage you can adjust several settings for processes that take a lot of CPU resources for an amount of time. Possibilities are notification (see for more info at management), logging in his own log file, notify the user with a message and forcing to kill the process (or a combination of these options). The last option is recording, enabling this option makes it possible to make reports (see management part). Just like Appsense the configuration settings for Memory are more limited. Only the usage option is available for configuration. These configuration is exactly the same as with the CPU but then for a limited on used memory. This is only based per process, not per user or other possibilities. Also at memory level recording can be enabled for reporting. 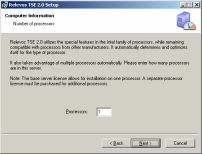 The last configuration setting is the processes option. Besides the standard Windows processes, it is possible to add additional processes which will not be controlled by Relevos for CPU and memory. This setting overrules specific settings in the advanced options of CPU or memory. The other parts are all related to monitoring and reporting, so these will be discussed in the management part. 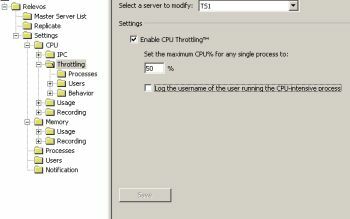 With the standard tooling you configure the setting per server. Although you can import and export these settings you need to this manual. But all standard configuration settings are stored in the registry. It is pretty easy to export this keys and via scripting importing the settings on other servers. With the Management System tool you can configure the settings on one server and then replicate them to the other servers. This is a wonderful console, just with two critical notes: all server need to be added manual to the console and it is not possible to schedule the updates of the configuration. Further it works fine and is definitely a value add to the Relevos product. WMSoftware understands the necessity of monitoring and reporting so several components are setup for these management tasks. First there is a component Users. Here can be setup what need to be logged concerning users. Think of user logon, logoffs, connected and disconnected user. Of course standard Microsoft tools can do the same, but it is nice it is available for the same point of administration. Additional a notification can be send if more than the configured limit of disconnected user has been reached and a possibility to log off disconnected users (except the users configured). Relevos has limited reporting options directly in the product. If you enabled Recording within the Report option you can show the values collected of the processes which uses the most CPU and memory in a chart view. All log files (also the ones which are viewable within Reports) are tab separated files, so they can be easily import them in for example Excel and made some graphical views for reporting to the management. If you setup notification in the usage part of CPU and/or memory, then you need to configure the settings in the Notification part. Here are also several possibilities to configure the notification to your needs, for example record to the event viewer, record to the main log of Relevos, send a message to a computer, send an e-mail ,send a message to a pager and/or send a SNMP trap. On the configure tab you can specify the devices/server which should be used to deliver the message to the specified medium. At last Relevos has also an information part. On the statistics tab some standard data are displayed like OS, memory, CPU and so on. The health tab shows real time usage of the most important resources like CPU, Disk, Network and memory. If a product like Relevos works fine users will not notice the influence of the product. At this point Relevos scores high. We overwhelmed our server with the n! option on the calculator so the processor usage was continues on 100%. When we started a new RDP session the reaction times were pretty good, when we started for example Wordpad IPC enables normal reaction times so the user did not notice that the CPU was very busy at that moment. Relevos is a pretty good product, which is getting close to for example Appsense Performance Manager. The management tool is real value-add, but we would like to have the possibility of scheduling. 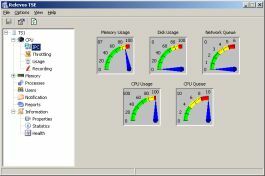 Relevos is a little bit simplistic and some configuration are inferior in comparison with Appsense Performance Manager. But the main thing (IPC and CPU throttling) works fine.